eXo Platform organizational entities (users, groups and memberships), can be stored in a database or a directory such as OpenLDAP or Active Directory (AD). This chapter documents how to configure eXo Platform to plug to a directory. Please notice that this integration is not SSO (Single Sign On). If SSO is what you need, read the SSO chapter, eXo Add-ons guide that explains how eXo Platform works with a directory through an SSO service like CAS or OpenAM. eXo Platform supports only the read-only mode with a directory (LDAP/AD). Only one single directory is allowed. The mapped organizational entities from directory are imported in one way direction: from the directory to eXo Platform. Introduction An introduction about directory server integration basics. Quick start A step by step tutorial for eXo Platform configuration with a directory server. How to map multiple DNs for users? A step by step tutorial to map multiple DNs for users from your directory to eXo Platform. How to change default mandatory users attributes mapping? A step by step tutorial to map default users attributes. How to map additional user attributes? A step by step tutorial to map additional users attributes than the default ones. How to map multiple DNs for groups? A tutorial allowing to map multiple DNs for groups from your directory to eXo platform. How to map directory groups to a new eXo Platform group? A tutorial allowing to map your directory groups to new eXo platform groups. Configuration reference A reference guide about PicketLink IDM configuration and eXO Platform configuration. Frequently asked questions How to resolve some possible issues of a directory integration. It can be plugged to an already populated directory, in read-only mode. The directory can contain users and groups, or only users. 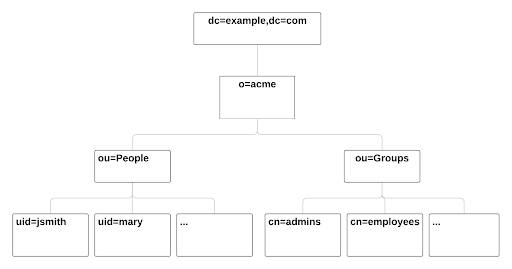 Structure of users and groups in the directory can be finely customized. The supported directory implementations are: OpenLDAP and Microsoft Active Directory. You can refer to our official supported environments matrix for more details about the supported versions. The term “Directory users” represents users who are created in the directory by its utilities. The term “Platform users” represents users who are created via eXo Platform UI. The understanding is similar for “Directory groups” and “Platform group*”. The following section is a step-by-step tutorial to integrate eXo Platform with a directory server. If you want to know more about PicketLink IDM configuration, you can refer to the official documentation of PicketLink. In this quick start, you configure eXo Platform to read information of users and groups from the directory. It might not match your need exactly, but after this start you will have everything packaged in an extension, that you can adapt by following the following sections. The ldap-extension is technically a portal extension that is described in Developer guide, but it does not require compilation as it requires only xml files, so administrators can pack the war archive without using a Maven build. If you are a developer, you can create a Maven project for it like any other extension. Copy content from one of PicketLink sample files to your picketlink-idm-ldap-config.xml file. picketlink-idm-msad-config.xml if you use MS Active Directory. picketlink-idm-ldap-config.xml for other LDAP compliant directories. ctxDNs of the USER identity object, which must be the root DN of the users. ctxDNs of the platform_type identity object, which must be the root DN of the groups mapped under the eXo Platform /platform group. providerURL: Should use SSL (ldaps://). customSystemProperties: Give your truststore file path and password. This step enables mapping of directory groups (platform and organization - that are predefined groups) to eXo Platform. If you bypass this step, only user mapping is performed. Configure your extension by following the steps 3, 4 and 5 of Creating a portal extension. Package and deploy your ldap-extension into Platform. For JBoss, don’t forget to declare deployment dependency. Make sure the directory server is running, then start eXo Platform. Do not include the ldap-extension folder itself into the .war. The .war should contain META-INF and WEB-INF folders at root of the archive, it should not contain ldap-extension folder. That’s why you need to go to inside the folder first. You should have ldap-extension packaged in .war when deploying it to production. However when testing, if you feel uncomfortable having to edit a .war, you can skip compressing it. In Tomcat, just deploy the original folder ldap-extension. In JBoss, rename it to ldap-extension.war. If the integration was successful, the directory users and groups will appear in eXo Platform under the menu Administration –> Users –> Manage Users. Open the configuration file picketlink-idm-ldap-config.xml. Search for the option ctxDNs. Since only one type of user can be defined, all users of these DNs must share the same attributes mapping. You can update them in the file picketlink-idm-ldap-config.xml to match your specific mapping. As in previous sections, we assume that you already have a populated directory and some groups that should be mapped into eXo Platform. To be clear about the LDAP “group”, it should be the “groupOfNames” objectClass in OpenLDAP or “group” objectClass in Active Directory. In OpenLDAP (default core.schema), the groupOfNames must have the member attribute. In the Quick start chapter we map the directory groups to default eXo Platform groups /platform and /organization. In this chapter we will learn how to map directory groups into a new eXo Platform group. 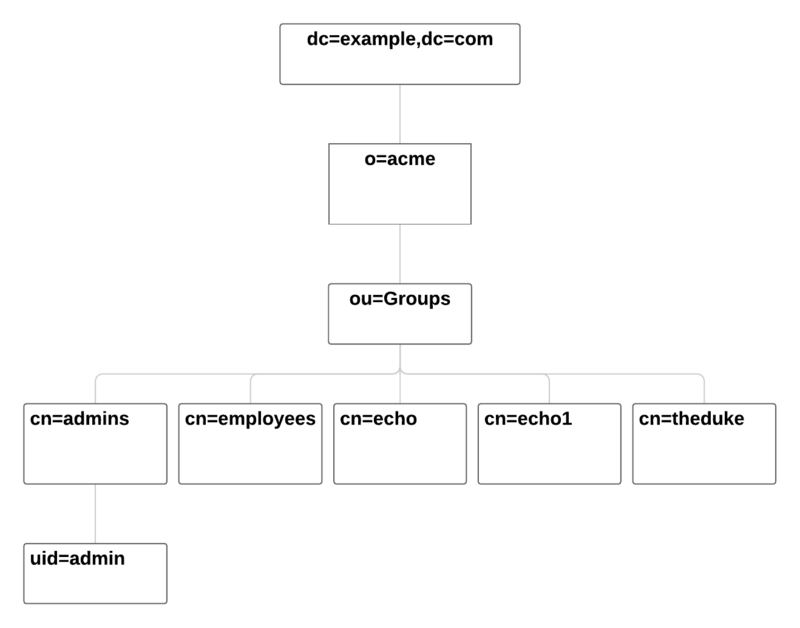 Let’s say we want to map the groups contained in the directory DN o=acme,dc=example,dc=com into the eXo Platform group /acme. As a prerequisite, the group /acme must be already created in eXo Platform. idAttributeName: attribute name to use as the group id. ctxDNs: base DN of the groups in the directory. entrySearchFilter: search expression to filter objects to consider as groups. parentMembershipAttributeName: attribute which holds the list of group members. In OpenLDAP or MSAD default schemas, the member attribute is used, but your schema may use another attribute. This section is a complete description of the available configuration options. It lists the options of both eXo configuration and PicketLink configuration. You can adapt the configuration by updating these services configuration in the file idm-configuration.xml as described in the Quick Start section. config (value-param): location of the PicketLink IDM configuration file. The “war:” prefix allows to lookup the given location in all deployed webapps. hibernate.properties (properties-param): list of hibernate properties used to create SessionFactory that will be injected in Picketlink IDM configuration registry. hibernate.annotations: list of annotated classes that will be added to Hibernate configuration. hibernate.mappings: list of .xml files that will be added to the hibernate configuration as mapping files. jndiName (value-param): if the ‘config’ parameter is not provided, this parameter will be used to perform the JNDI lookup for IdentitySessionFactory. portalRealm (value-param): the realm name that should be used to obtain the proper IdentitySession. The default value is ‘PortalRealm’. rootGroupName : the name of the PicketLink IDM Group that will be used as a root parent. The default is GTN_ROOT_GROUP. defaultGroupType: the name of the PicketLink IDM GroupType that will be used to store groups. The default is GTN_GROUP_TYPE. groupTypeMappings : this parameter maps groups added with eXo Platform API as children of a given group ID, and stores them with a given group type name in PicketLink IDM. If the parent ID ends with “/*”, all child groups will have the mapped group type. Otherwise, only direct (first level) children will use this type. This can be leveraged by LDAP if the LDAP DN is configured in PicketLink IDM to only store a specific group type. This will then store the given branch in the eXo Platform group tree, while all other groups will remain in the database. forceMembershipOfMappedTypes: groups stored in PicketLink IDM with a type mapped in ‘groupTypeMappings’ will automatically be members under the mapped parent. The Group relationships linked by the PicketLink IDM group association will not be necessary. This parameter can be set to false if all groups are added via eXo Platform APIs. This may be useful with the LDAP configuration when being set to true, it will make every entry added to LDAP appear in eXo Platform. This, however, is not true for entries added via eXo Platform management UI. ignoreMappedMembershipType: if “associationMembershipType” option is used, and this option is set to true, Membership with MembershipType configured to be stored as PicketLink IDM association will not be stored as PicketLink IDM Role. associationMembershipType : if this option is used, each Membership created with MembrshipType that is equal to the value specified here, will be stored in PicketLink IDM as the simple Group-User association. passwordAsAttribute: this parameter specifies if a password should be stored using the PicketLink IDM Credential object or as a plain attribute. The default value is set to false. useParentIdAsGroupType: this parameter stores the parent ID path as a group type in PicketLink IDM for any IDs not mapped with a specific type in ‘groupTypeMappings’. If this option is set to false, and no mappings are provided under ‘groupTypeMappings’, only one group with the given name can exist in the eXo Platform group tree. pathSeparator: when ‘userParentIdAsGroupType’ is set to true, this value will be used to replace all “/” characters in IDs. The “/” character is not allowed in the group type name in PicketLink IDM. Realm: identity realm used. This parameter must not be changed. Repository: Where your store and identity object type is used, by Id reference. Store: The center part of this guideline, where you configure the directory connection, identity object types and all the attributes mapping. It is the only supported mode. In combination with ctxDNs, this option forms an LDAP query. It is equivalent to the scope parameter of the ldapsearch command (-s in OpenLDAP). If the option is omitted, the search will return the children at level 1 of the ctxDNs - equivalent to -s one. Use subtree to search in the entire tree under ctxDNs. It is useful saving you from having to provide all the possible ctxDNs in configuration. The object value is equivalent to -s base that examines only the ctxDNs itself. If the ctxDNs entry does not match the filter, the search result is zero. subtree: user1 and user2 are mapped. object: no user is mapped. If omitted: only user1 is mapped. A: Not any condition except that the top DN should be created before being integrated. A: LDAP users are visible in the Users and Groups Management Page but they are unable to sign in eXo Platform. More exactly, they do not have access permission to any pages. It is performed in the User and Group Management Page (http://[your_host]:[your_port]/portal/g/:platform:administrators/administration/management). Just go to this page and add users to appropriate groups. The /platform/users group is required to access the intranet page. See more details at PicketLink IDM configuration. 5630e5ba send_ldap_result: err=49 matched="" text=""